OYO Hotels & Homes, South Asia’s largest, and the world's fastest growing chain of hotels, homes, and spaces, has partnered with the 16th Season of Roadies, India’s longest running reality show. Droom.in MTV Roadies Real Heroes, powered by OPPO, Co-powered by Frankfinn Institute of Air Hostess Training & Woodland, focusses on real-life heroes; OYO and MTV have joined hands to offer contestants the best hospitality experience and make their journey comfortable. 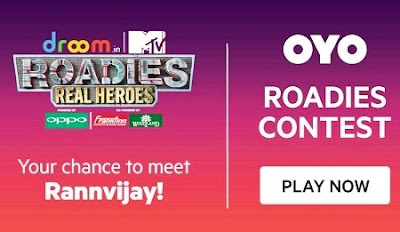 In addition to this, with the aim of engaging with the fans of MTV, OYO Hotels & Homes will be running OYO Roadies contest on its app, starting 7th April, where five lucky winners will get the opportunity to meet the popular host and celebrity Rannvijay Singh, and win other exciting prizes every week. Roadies Real Heroes Season 16 winner will win a mega prize from OYO - 12 months’ worth of free stay at OYO Home properties - exclusive and beautifully designed villas offering full comfort, space, and privacy. Moreover, all other Roadies contestants will also win a comfortable stay for 2 nights & 3 days at a OYO HOME property. Additionally, OYO has planned a 360-degree multimedia campaign including digital & social channels like Facebook, Instagram, e-mailers, web/application banners, push notifications and a series of TVCs. The TVCs make for an intriguing watch as they explore relatable real-life scenarios showcasing how fans of Rannvijay Singh are really excited to meet him and the OYO Roadies Contest gives them the chance to fulfil their wish.